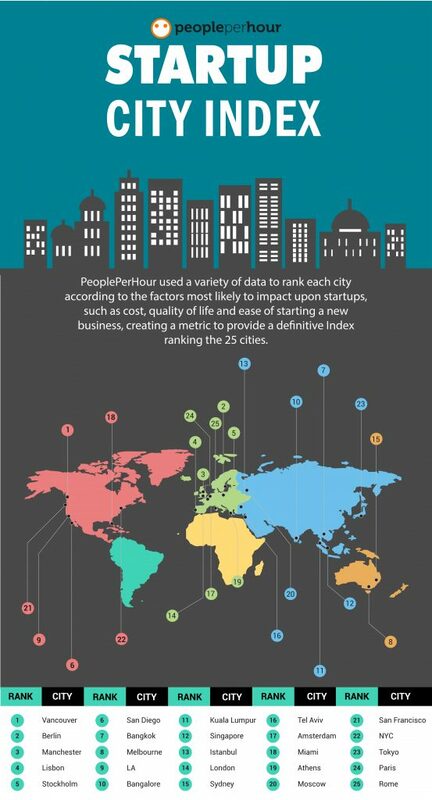 In a new study conducted by PeoplePerHour, we list and rank the best cities for startups! We used a variety of data to rank each city according to the factors we thought would most impact startups. Where city data was not available country data was used and equal points given to each city within that country. For example, best for doing business points were given according to the World Bank Doing Business country rankings and NYC, LA Miami and San Diego were given equal points for this metric. Similarly Starting a Business was based on country wide rankings. All others were city based.